This giveaway is open to US residents ONLY. If you are under 18, please get a parent's permission. 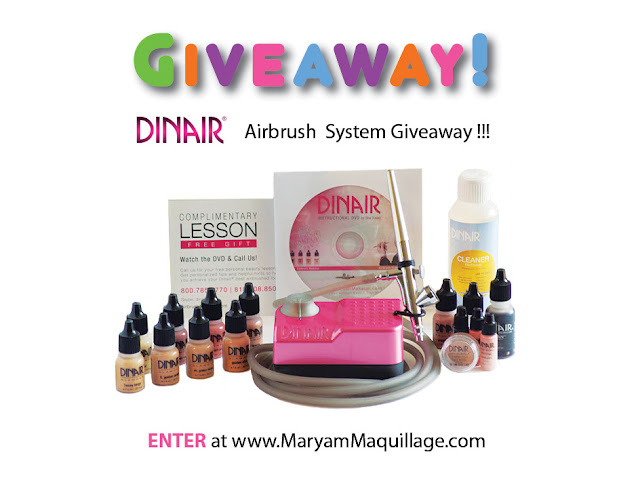 You MUST PUBLICLY follow this blog via GFC (Google Friend Connect on the sidebar) and MUST "LIKE" Maryam Maquillage & Dinair Airbrush Makeup on Facebook to be entered in the giveaway (min. 3 entries). 13 Additional Entries are possible for a total of 16 entries per participant. Entries will be verified for honesty and accuracy. Cheaters will be disqualified. This giveaway ends at 12:01 AM (EST) on 6/19/2012. The winner will be chosen at random, announced and contacted, after which he/she will have 24 hours to respond, otherwise a new winner will be chosen again at random. The winner will choose their compressor color, as well as their shade range or get color matched by Dinair. Congratulations on your spectacular achievement of having an incredible following of 1500 ! Wow ! Thank you so much Ram!!! I'm excited! This is great! SO so exciting, thanks so much for hosting this!! 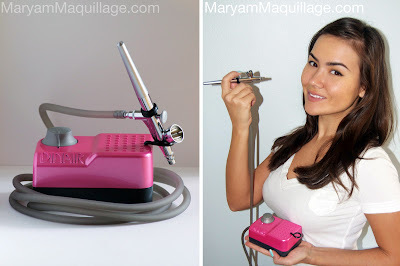 I always wanted the Dinair airbrush kit! Thanks for hosting this!! congratz on 1500 followers! Awesome giveaway. The Dinair Airbrush looks amazing!! I am so excited! I have been dying to try an airbrush system!! I would DIE if I won!! would love to win of course! congrats! Yesh I am excited and would love to win! thanks for the giveaway and congrats on your followers! Yes, I would so love to win and try out airbrush makeup. What an awesome contest! Congrats on reaching 1500 followers!! Congrats on the 1500 followers! This is an amazing giveaway.Thanks for doing it! Omg awesome giveaway!!! YES I am excited! I'm so glad you are doing this giveaway! I've been trying to win a kit from their website for months! Thank you!! SUPER EXCITED!!! You are SO awesome to do this giveaway! I want this so bad! Thank you for this chance!! I just found your blog through Pigments and Palettes. Love it! And I commented on this look on Makeupbee a few days ago and had no idea this was you! this is one of the best giveaways ive seen for a long time! 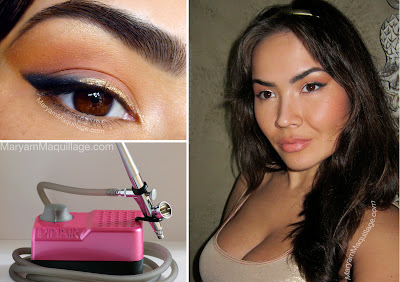 I love airbrush makeup and this is an awesome giveaway! Thank you!! amazing giveaway! I'd love to try this system! Congratulations on your success! You are an amazing artist. This giveaway would be a dream come true! Love your work, love Dinair! I really, really, really want to win a Dinair!!! Thanks for the chance! Awesome giveaway. Thank you for hosting it. I would love to win this kit. Congratulations of your follower milestone! You truly deserve it. This is an amazing giveaway. I've been dying to get one of the Dinair Airbrush Systems to use for my freelance makeup jobs so this would definitely come in handy. Good luck to everyone! Yes, I'm definitely excited for this giveaway! Congrats on reaching 1500 followers, that's wonderful! So exciting! Congratulations on 1500, that's huge! It's a really awesome thing you're doing to celebrate it. I am super excited about this giveaway! You deserve all of your followers and many many more! I love all of your looks and tutorials. I always wanted a Dinair airbrush system! Thank you Maryam & Dinair! congrats on your blog readers!! and thank you for hosting such a great giveaway!! Yes Super excited!! Congrats and thanks for the great giveaway!! Yes I am very excited! Congrats on 1500 follows! Sorry about that MJ... I promise to make it up to all my international friends!!! Winning the Dinair airbrush would complete my summer and my destination wedding. Fingers crossed that I win! Congrats on reaching 1500 followers....and counting! i really want to buy some stuff it´s perfect!! !i love ur bloggggg and u´re beautiful! The first thing I noticed is that the airbrush feels really nice. You can tell that it is professional because it is weighty and easy to hold. This is a welcome change to some of the thin airbrushes that you feel like you are going to break if you squeeze to hard. Once I hooked it up and got it going I was surprised with how quiet the machine was. The machine is not as small as some of the other smaller airbrush makeup kits but what it lacks in compactness it more than makes up for in power. Doing an air tan with this compressor was very fast. In case you want to do more delicate areas, there is also a speed adjustor which is very accurate.